Making an early start, we pedal our way north to one of two great irrigation reservoirs from the Angkor period, the West Baray. We ride along the wall of this impressive man-made lake and then ride south along the canals that are fed by the Baray. In the late morning we find ourselves in a small village, typical of those surrounding Siem Reap. Life here is still simple and based on seasonal agriculture. We take a walk through the village with a local resident who will explain the workings of this community before we sit down to a tasty lunch and spend some time chilling in a hammock. As the sun begins to drop in the sky, we make our way to a nearby river and shuttle by boat to our kayaks. We then take a paddle through the floating villages, where friendly locals will greet you with smiles as you are using a manner of transport that impacts their lives far less than the noisy, smelly and disruptive tourist boats that sometimes come through. After exploring the neighborhood and possibly also some of the mangrove forest, we set out for the open lake where the sheer size of this body of water becomes apparent. 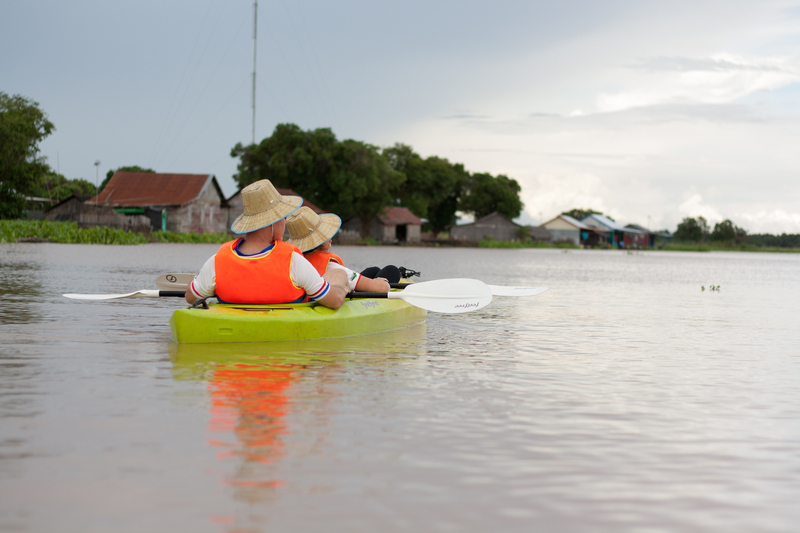 Your guide will explain the phenomenon that results in a depth variance of up to eight meters and why this lake is vital to Cambodia's survival. We return to Siem Reap by car and can expect to arrive back around 6:30pm, depending on the seasons and the time of the sunset. This ride is predominantly on flat tracks and small roads - there is only one, tiny hill, so anyone who can reasonably ride a bike can do this tour. There are some sections on small dirt trails with sand so beginner riders should not choose this tour. The kayaking is on flat water for around 2 hours so it's perfectly achievable, even for those who haven't kayaked before.